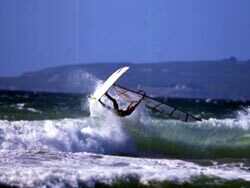 In the region of the traditional area "Kouremenou" and in distance about 350 metres from the "GALINI Apartments" it functions the last ten years with big success a completely organised surfing club as the weather and the clean sea of the area encourages this sport lovers. East Crete area stands for strong winds. The meltemi blasts in from the north between the hills, with forces of 7 - 8 no rare occasion in summer. Kouremenos has the position, where the meltemi is at its most reliable and strongest. If you are surfing lovers, we are waiting for you in one from the most ideal places in Greece in order enjoy your loving sport with safety.